Having been laid up with a knee injury sustained playing football (soccer), I haven’t been able to hit the golf course for over a month. With constant rain delays during the U.S. Open over the past week, I was coaxed to come out of temporary retirement for a quick nine holes on Saturday. I was fine, a little rusty, but all in all it just felt great to get back out on the course after a long layoff. Â My biggest concern, as usual, were the poor habits and fundamentals of my friends. All three of them can hit the ball, but none of them can putt to save their lives. This is not surprising in the slightest, considering 95% of their already limited practice time is spent on the driving range, and not on the practice green. Two of them are what I would call “recreational players”. Guys who are out there just to have a good time, where their performance is not of the highest concern. The other one is a gradually improving serious golfer who has gotten much better over the last two years, and takes the game very seriously. All that aside, the three of them have the same major problem with their golf game: short putts. I maintain, and will always maintain that the biggest reason mid to high handicappers miss so many short putts is BECAUSE THEY NEVER PUTT THEM!!! They lag a 20 footer up to about three feet from the hole, and then just rake the ball back to themselves…I hate that. The ball isn’t in until it’s actually in, but that’s a whole different story. The other reason they miss short putts is because of a mechanical flaw in their short putting stroke. Not all putts should be hit the same way. A lag putt should be hit with a longer flowing stroke in an attempt to establish a consistant feel for the speed of the greens. When you get inside of the dreaded six foot range, it becomes all about the line. In order to keep the ball on line on a shorter putt, you need to use a shorter stroke. I see way too many people take the putter back on a five footer like they are hitting a 15 footer. Then, to compensate for that, they decelerate on the way through the ball. A serious mechanical flaw. For a putt in that range it is only necessary to take the putter back a couple of inches. If anything, this will help you keep the face more square, and the putter on the correct line, since it is traveling less distance, makes sense right? Also, since you aren’t taking it back as far as you usually would, it will force you to accelerate on the way back to the ball. Unlike a change to the full swing, this is not a mechanical flaw that will take a lot of time and practice to incorporate. It is more psychological than anything else. The next time you get out to play, get to the course about a half hour or an hour earlier than you usually might, and hit the practice green. My favorite drill is the 2-4-6 drill. It’s pretty basic, find a flat putt or a straight up hill putt, and put a ball down at two feet, four feet, and six feet from the hole. Start with the two footer and work your way back, and keep repeating the process with a short, solid, and strong stroke. I guarantee you will be more confident and consistent with the short ones if you stick to a shorter stroke. And this way, you won’t have to rake back that three footer, you can just knock it in. The US Open delivered so many great and poignant stories that, for not more than a moment, one may forget the best one of all â€“ Lucas Glover’s emergence as a golf major winner. There was Tiger Woods â€“ always a story no matter what, Phil Mickelson’s brave performance in the face of adversity and the return of David Duval to near the top of a leaderboard. We may even include Ricky Barnes’ final round collapse, though we would rather remember his amazing first three rounds. But the real tale was that of Glover, a qualifier for the tournament who held on to win his first-ever major title and leap into the top 20 of the world rankings. Glover closed with a 73 for a four-under-par total of 276 at Bethpage Black. That was two strokes better than Mickelson, Duval and Barnes. Glover’s opening two rounds of 64 and 69, after overcoming rain that pushed the tournament into a fifth day, put him in a good position for the final two rounds in which he didn’t have to break par to win. World number one Woods, looking for his 15th major title, had gone into the tournament on a high following his victory at the Memorial a fortnight prior. However, an opening 74 left many wondering if he would even make the cut. But it true fighting style, he recovered to shoot three sub-par rounds to finish tied for sixth on 280. Indeed, Woods, for what it is worth, would have been champion had only the last three rounds counted. Now, though, for the first time in five years, Woods is not a defending major champion. Mickelson’s second place was nothing if not inspiring. Lefty had only recently returned to the US PGA Tour after taking time off to be with his wife Amy, who was recently diagnosed with breast cancer. And then there was Barnes. Like Glover, he was a relative unknown who quickly made himself the man to beat with rounds of 67, 65 and 70. However, a 76 on the final day meant he was unable to challenge for the top prize. Glover may not have been the winner everybody wanted but there is no doubt he fully deserves it. Champions are separated from others not only by their ability to shoot low scores but also by being able to handle the pressure when it comes to the crunch. And Glover proved he was up to the task. I must admit, seeing David Duval‘s name near the top of the leaderboard at the U.S. Open on Friday made me happy. But, like most golf fans and spectators, I did not expect it to last very long. He contended for a brief period at Royal Birkdale last year, but faded on Saturday with a disastrous 83. As the week progressed, Duval looked less like the man who over the last seven years has struggled to break 80, and more like the man that held the #1 c for 15 weeks back in 1999. Even though David fell short on Monday afternoon, many would argue that even before he teed off on that day, he had already won. Duval was back where he belonged, contending for a major, and he was loving every minute of it. From Duval’s own words the worst thing that ever happened to the longevity of his golf career was winning the 2001 Open Championship at Royal Lytham & St. Annes. Duval remembered saying to himself “Is this it?” after finally winning his elusive first major championship. He didn’t fully appreciate the significance of his win, because he didn’t have anyone to share it with him. His marriage was falling apart, and he was alone. Shortly after his triumph at Lytham, his golf game fell apart as well. A series of injuries, personal problems, marital problems, swing changes, body changes, and a bizzarre bout with vertigo derailed Duval’s career right when it was supposed to take off. And then, David just sort of disappeared. Every once in a while you might see him playing in some obscure tour event where he could get in, but it almost seemed comical that he was continuing to put himself through what looked like torture. All along he would continue to say that he was getting better, and finally, he was happy. Duval was remarried and had kids of his own, five of them to be exact. In a post tournament interview Duval said that he never thought for one second that he was washed up, or would never make it back to the top. And this week on Long Island, he proved himself right, and thousands of critics and doubters wrong. After starting Monday’s round with a brutal triple bogey, due to a horrible break with his ball burying in the green side bunker, it looked like his wheels were about to come off. Duval had fallen six behind, but he rebounded from that triple by playing the rest of the way three under par. I didn’t think he had a real shot to win until he poured in a birdie at the difficult 16th (his third in a row) to tie for the lead. At this point I found myself just flat out rooting for him. How could you not? Lucas Glover won the tournament with a gutty performance down the stretch, but David Duval stole the show. Is it possible this was a one week aberration for DD? Yes, it’s possible, but I really believe he took a major step forward with his confidence this week. When asked after his final round where his magical week came from, (Duval had struggled on the PGA Tour in 2009, missing 9 of 13 cuts) Â Duval said that his kids have never gotten to see him play great golf before. His kids knew he had won a whole bunch of tournaments (13) before they were born, but they never got to see him do it in person. They finally got that opportunity at Bethpage on Monday. Well done David, and let me be the first to say “Welcome Back”. The golf industry’s financial situation is similar to the one Tiger Woods finds himself at just past the half-way stage of the US Open â€“ both need a major comeback. He is the man who can save both himself at Bethpage Black, and the industry. At least this is the opinion of Pete Bevacqua, the United States Golf Association’s chief business officer. Woods finds himself 11 shots behind the leader, American Ricky Barnes, after two rounds of the Open. Barnes overcame difficult conditions, including a rain stoppage on the first day, to post an fantastic eight-under-par 132 with rounds of 67 and 65. Defending champion Woods is with a group of golfers tied for 34 on 143. He recovered from his first round of four-over 74 to shoot 69 in the second round and make the cut. TARP refers to the US government programme to save financial institutions and Woods is seen as similar to a bailout for golf. Although golf is still in a healthy position compared to other industries around the world, which are feeling the effects of the global financial meltdown, it is still suffering. The PGA Tour has not lost any tournaments but prize money has gone down. The US Open also failed to sell out all of its 42,000 tickets for the first time since 1986. The availability of tickets was mainly because of the lack of corporate sponsorship. While Woods is playing an unwitting role in golf as a whole, his mind is more focused on winning his 15th major tournament. He needs a huge effort, though, as qualifiers Barnes and Lucas Glover head the leaderboard. Glover is one shot behind Barnes after rounds of 69 and 64. Canadian Mike Weir is alone on third at 134, one stroke ahead of Sweden’s Peter Hanson, Japan’s Azuma Yano and former British Open champion David Duval, who appears to be on a comeback trip of his own. The People’s Open. That’s what they called it. Seven years ago, for the first time in its history, the United States Open Golf Championship was played on a public course in New York, and I was there. Well, sort of. I was in New York City playing tourist, standing under Empire State Building, wanderingÂ blissfully through Central Park and paying my respects at Ground Zero, a place that was still fresh in people’s minds less than 12 months after that fateful day in September. My friends and I were staying just over the border in Stamford, Connecticut and riding the train to Grand Central everyday. On those train rides in and out of town we encountered golf fans heading to or coming from Bethpage State Park where the U.S Open was being played. Regular golf fans, commuting to watch one of the biggest golf tournaments in the world. The people’s open, on a course they themselves could play for $45. We had to settle for watching it on TV at the TGI Friday’s in Times Square. It was bold gamble by the USGA, an organisation not known for boldness or gambling for that matter, unless of course you consider preparing a U.S Open course for play gambling, and many would. But it payed off big time. Seven years on and the U.S Open is back at Bethpage Black and the main players from that first Bethpage Open are back as well. A lot has happened inÂ seven years. Back then we had a Republican government in this country, a strong economy, dot.com bubbles bursting andÂ Enron scandals filled the newspapers. We were engaged in a confusing war in the middle eastÂ and the Los Angeles Lakers were dominating basketball. I guess some things don’t change. But much has changed in the world of golf and a look back at the 2002 U.S Open reveals just that. In 2002 Tiger Woods was the number one player in the world. Not much has changed in that respect. For over a decade the man has been the dominate force in the golf world, a tornado whipping its way mercilessly through major after major, leaving nothing but scattered opponents and broken records inÂ its wake. Back then, at the first Bethpage Open, Tiger was on a run unprecedented in golf history. His wire-to-wire three shot win at Bethpage Black marked the 7th major he had picked off in the last 11 events. A year earlier at the Masters, Woods held all four majors at the same time, something not done before or since, even by himself. If it wasn’t for getting caught in some of the worst weather in British Open history a month later at Muirfield, weather which led to a third round 81, Woods may have wonÂ three majors in a row and have been on track for the 2002 Grand Slam. He was that close to perfection. Today Tiger is a far different animal than he was back then. He is married for one, and a father of two for another. He is a business man approaching a reported billion dollar lifetime earnings, a noted philranropist and a Presidential friend. He has grown as a person in size and stature before our eyes over the past seven years. A Tiger under a microscope. On top of that, as woods steps onto the first tee of the Black this year he is the holder of 14 career major championships. The hunting season for Golden Bears seems to get shorter every year. Between 1997 and 2002, a span of six years and 24 major championships, Woods wonÂ eight times. Between 2003 and the 2009 U.S Open, a span of seven years and 23 majors played, Woods has wonÂ six times. He has slowed down, but not by much. Jack Nicklaus was asked a fewÂ weeks at the MemorialÂ what stretch in his career he though he played his best golf. “Between the ages of 33 and 38.” was his reply. Woods will be 34 in December. It may have been the “aww, shucks” attitude, the easy smile, or the way he high-fived the fans on the walk between every green and tee, but whatever it was, at the 2002 U.S Open Championship Phil Mickelson became the people’s champion. The fans rallied behind Mickelson like no player since Arnold Palmer, cheering his every step, wave, grin and putt made. In the end it wasn’t enough, as Mickelson would finishÂ three shots behind Woods and rack up his second runner-up finishÂ at the U.S Open. But there can be no doubt the 2002 U.S Open was Phil Mickelson’s coming out party. Before 2002 he was one of the top players in the world without a doubt. He was on the cusp of greatness, but he wasn’t loved. The fans didn’t realise, but it was Tiger who grew up on public dust bowl courses in Southern California, military base tracks he would play over and over with his father, Earl. Phil, on the other hand, had his pilot father build a putting green for him in the family back yard. As a teen he was Tiger before there was a Tiger. Winning a professional event before he left Arizona State. He seemed destined to marry the prettiest cheerleader in the squad- and he did. But fame and fortune don’t win you majors and that’s what seemed to endure Mickelson to the Bethpage fans- the man with everything had somehow become the ultimate underdog, and people loved him for it. Fast forward to today and Mickelson, like Woods, has grown as a player and a person. The consensus number two in the world, Mickelson has won his majors, three of them in fact, and has as many children to go along with those trophies. But the prettiest cheerleader is not doing so well. Amy Mickelson was diagnosed with breast cancer less than a month ago. Mickelson has already announced he will more than likely not play in the British Open next month, so his return to Bethpage Black is sure to insight a frenzy of crowd support maybe never beforeÂ seen in the sport. In 2002 he became the average golf fan’s favourite player, in 2009 he may well be the entire world’s sentimental favourite. The final player in the saga that was the 2002 U.S Open, the man who played with Tiger Woods on Sunday,Â is Sergio Garcia. While Mickelson was the gallery’s Cinderella, GarciaÂ played the ugly step-sister. The never-compromising New York fans didn’t take kindly to Garcia’s constant re-gripping of the club, a pre-shot spasm that, at the time, was almost at its cringe-inducing best. Sports Illustrated called the crowd “blessedly unruly”, and clips of a flat-topped, beer-bellied fan urging Garcia to “Hit the ball!” appeared on highlight reels across the world. They were the best and worst of golf fans and Sergio Garcia, the wunder-kid from Spain, felt the rough end of the New York shtick. In 2002 Garcia was a 21 year-old star in the making. A 3-time PGA Tour winner, he was the heir-apparent to Tiger, the man most likely to challenge him in years to come. His 4th place finish that year at BethpageÂ appeared butÂ a stepping stone in the path to greatness, a greatness that would be defined by majors and major wins. But the years have come and gone, as have the majors, and Sergio is still putting up a bagel in the wins category. Duel heart-breaking losses to Irishman Padraig Harrington over the past two seasons haveÂ turned Garcia from the matador into the bull. The 2008 Players,Â the biggest win of his career, hasÂ cemented his reputation asÂ the consensus “best player never to have won a major”, the perpetual money on his back. He has dated former world number one tennis stars and a former world number one golfers’ daughter, but like the majors, can’t seem to hold onto one. The good news for Garcia is he is still young, not turning thirty until early next year. When Phil Mickelson came to Bethpage Black in 2002 he was 32 and major-less. Garcia can take solace in that fact. When Mickelson eventually won his first major, the 2004 Masters, he spoke about getting that monkey off his back. “It felt more like a gorilla.” he said. Weather the Bethpage fans embrace Garcia and his gorilla is anybody’s guess. Woods, Mickelson and Garcia have all grown since the last time the U.S Open swung through Bethpage Black. They have grown from kids to men, from bachelors to fathers, from also-rans to major championship winners. In 1964 British documentary director Michael Apted and associates Paul Almond and Gordon McDougall started a social experiment where they took 14 children from different socio-economic backgrounds and filmed them talking about their lives. Apted has returned and filmed the lives of these 14 children every seven years since 1964 calling the series 7 Up! The next installment, 56 Up!, is expected to be out in 2011 on the BBC. The idea behind the series, one of the most important in documentary film-making history, is to show the development of the children as they grow and their lives and ambitions change. The 2016 U.S Open site has yet to be announced, but by that time Woods will be 40, Mickelson 45 and Garcia 36. One can only imagine the change those years will bring. One thing’s for sure, it’s going to be fun to watch. The USGA will contest its national championship on Long Island for the fourth time since 2002, when the event was also hosted by the Black Course at Bethpage State Park. The story last time around was the U.S. national championship being held at a publicly run and operated golf course for the first time in the championship’s 102 year history. Having attended the event myself, I can vouch that the other major story was the loud, boisterous, and sometimes rude gallery throughout the event. It was without question the loudest golf tournament I have ever attended, which was fine, but the gallery was very harsh toward to certain players during the tournament. Prominent European players were the frequent targets for the New Yorkers who often mistook Bethpage Black for the grounds of Yankees Stadium. Players such as Sergio Garcia, Lee Westwood, and Colin Montgomerie were subject to the abuse of the pro-American crowd. Garcia for his insufferable “waggling” of the golf club during that time, and Westwood and Montgomerie for their constant presence on the European Ryder Cup Teams. I myself was rather embarrassed for the gallery’s performance. It marked the first time I heard “boos” on a golf course, and I hope it was the last. Golf is a gentleman’s game, and there is no place for that. I only hope my fellow New Yorkers remember that this week. There are several great possible story lines going into the event, and I would hate to see it overshadowed by unruly behaviour. Now that I got that out of the way…on to the golf! I played this golf course back in 2002 when I was in college and I can say first hand…it is long. Bethpage measures 7,445 yards (6,808 meters) and it will play every bit of it. Rain is forecasted for all four days of the event in an area that has already had precipitation in 31 of the last 45 days. Now, I hate being the guy that says ‘you can only win on this golf course if you hit the ball ‘X’ distance’, but I can’t see anyone scraping the ball around and holding the trophy on Sunday. This is a true long hitters golf course, and I believe we will see the results of that on the weekend. Obviously, Tiger Woods is the clear favorite heading into the week. He is the defending champion, he won the last time the Open was contested at Bethpage, and he performed brilliantly on the weekend in his last appearance at the Memorial Tournament. Tiger is pretty much even money this week, but there will be some other definite contenders. Geoff Ogilvy: Geoff is a long ball hitter and a high ball hitter. He also won the last major contested on Long Island (2006 U.S. Open at Winged Foot). He has won two prestigious events on the season already, and no one would be shocked if he claimed his second major this week. Paul Casey: Already broke through with his first win on U.S. soil this year, and has the length and the game to win on this golf course. Camilo Villegas: This guy might be the best ball striker in the world at the moment, and seems to get better in every event he plays. He has the length, but does he have the short game? We will see. Angel Cabrera: This guy is always overlooked, and he is being overlooked again this week. The reigning Masters Champ, is only two years removed from his own U.S. Open triumph. El Pato seems to be a virtual lock for a top 10. Henrik Stenson: Absolutely love his game. The big Swede can hammer the ball for sure, and he has proven he can withstand the mental strains of major championship golf. Sleeper of the week:Â Nick Watney. Nick is a “boomer”, averages 302 yards off the tee, and has had an excellent campaign to this point. I like him to contend right up through Sunday. It has been 39 years since an Englishman last won the US Open. Paul Casey is aiming to break that long, barren spell. Tony Jacklin was the last English winner of the US Open, at Hazeltine in 1970. Not since Nick Faldo’s heyday has there been a golfer from Blighty who has stirred talk of a possible title until Casey started to hit form earlier this year. A string of fine performance has seen Casey rise to number three in the world, behind Tiger Woods and Phil Mickelson, both of whom have something to prove this weekend at Bethpage Black. Casey has played eight events on the PGA Tour this season, winning the Shell Houston Open and earning two other top-10 finishes. Justin Rose is another Englishman who is capable of performing at the highest level while youngster Rory McIlory is in the mix when it comes to British challengers. Another name to look out for is Eire’s Padraig Harrington, a double major winner last year and who is more than capable of fighting for top honours this weekend. However, as always, the main focus will be on American Woods, who is looking to defend the title he won in an epic 19 extra holes against Rocco Mediate last year. Woods won the Memorial Tournament two weeks ago to prove, once and for all, that he is back to his best after ligament surgery kept him out for more than eight months. He is looking for his 15th major title as he pursues Jack Nicklaus’ record of 18. Brian Gay made sure that his name would be added to the pre-US Open chatter. The American knew he needed something special at the St Jude Classic to book a place at the Bethpage Black tournament this week. And he delivered in record-breaking style, winning his second PGA Tour title of the season and third of his career. Gay shot a final round of four-under-par 66 for a wire-to-wire five-stroke victory over David Toms and Bryce Molder. Gayâ€™s total of 18-under-par 262 at TPC Southwind smashed the tournament record by six strokes and primes him nicely for the US Open, the second major of the season. Toms closed with 65 and Molder finished with 70 as they shared second place while John Senden, Paul Goydos and Robert Allenby shared fourth on 268, six shots behind the winner. His other victory this year was at Hilton Head when he triumphed by 10 strokes. Though the margin was smaller over the weekend, it was no less impressive. Gay had planned to take this week off after he failed to snare a US Open place via qualifying. However, his victory at the St Jude Classic means he is only one of five golfers going into the US Open with more than one victory this season. The others are Tiger Woods, Geoff Ogilvy, Zach Johnson and Phil Mickelson. Mickelson, making his comeback to the pro circuit after his wife Amy was diagnosed with breast cancer, tied for 59th place on 281, along with John Daly, the former double major winner who is returning to the tour after suspension. Mickelson was not concerned so much about his score as he was with getting back on the fairways after almost a month off. On the LPGA Tour, rookie Anna Nordqvist made her pro breakthrough by winning the McDonaldâ€™s Championship at Bulle Rock. Nordqvist scored a final round of 68 for a total of 15-under 273 and a convincing four-stroke victory over Lindsey Wright. Shin Jiyai finished third on 278 after her final round of 278, one ahead of Bae Kyeong. The menâ€™s European Tour takes a break this week as the players prepare for the US Open. An emotional Phil Mickelson is making his comeback to the US PGA Tour after a brief time away to be with his wife, Amy, who has been diagnosed with breast cancer. Three weeks ago, Mickelson said he was taking time off the tour to be at his wifeâ€™s side. However, with some encouraging signs on her health, the world number two decided to play at the St Jude Classic with an eye on next weekâ€™s US Open. Doctors said surgery is not necessary until early July, so the Mickelson family decided to continue life as normal until circumstances dictate otherwise. Mickelson will be a welcome face at Bethpage Black, where the US Open is being held. He practiced there earlier in the week and knows the course well. He was second to Tiger Woods in 2002 and his record at US Open tournaments held in New York is good â€“ he has never finished below fourth. Despite the problems, Lefty said his US Open ambitions remain high. His presence is more than merely therapeutic. He said he will be there to challenge for honours. It was the answer everyone, including his critics, were waiting for. Tiger Woods, the so-called has-been, returned to that familiar winning enclosure with victory at the Memorial Tournament in Dublin, Ohio. Having already won the Arnold Palmer Invitational this year following his comeback from knee surgery, Woods captured the event hosted by another great from the past, Jack Nicklaus. Woods birdied three of the final four holes, adding to an earlier stunning eagle, for a final round of seven-under-par 65. His total of 12-under 276 was one shot better than second-placed Jim Furyk. Drawing the usual gallery of thousands who watched his every move, Woods steadily clawed away at the lead, having started the final round seven strokes off the pace. By half-way at Muirfield Village, thanks to four birdies, he was three adrift. Then came the defining moment, at the 11th. Woods, who had hit every fairway in regulation on the fourth day, pushed his second shot, a five-wood, through the green and into deep rough. Using his customary great escape skills, he thwacked the ball with a one-handed follow-through and it trickled into the hole of a deafening eagle. That set the stage for his final run at the title, with Furyk venting his frustration at the media for always trying to write off the world number one. Said Furyk. Meanwhile, across the Atlantic, Denmark’s Jeppe Huldahl scored a final round four-under-par 67 for a total of nine-under 275 and victory at the Celtic Manor Wales Open. He won the European Tour event by one stroke from Sweden’s Niclas Fasth with Spain’s Ignacio Garrido third on 277. It was the 26-year-old’s first ever top 10 finish and it was in the position that mattered most. He is also the ninth debut winner of the 2009 season. On the LPGA Tour, Korean Kim In-kyung fired a seven-under 65 in the final round to win the LPGA State Farm Classic in Springfield, Illinois. Kim secured her second career title after holding off countrywoman Pak Se-ri, whose closing 66 was good enough for second place, one stroke behind Kim. Han Hee-won, Lee Jee-young and Angela Stanford tied for third at 15 under. Kim’s first victory was at the 2008 Longs Drugs Challenge. Six months after being suspended by the US PGA Tour, the people’s favourite John Daly is set to return to the circuit that made him a global star. Daly, who has won two major titles but more recently has been making headlines off the golf course, is to play in the US Open qualifiers in Memphis on Monday. He is then scheduled to tee off in the St Jude Championship. The 43-year-old’s best performance so far in Europe was second place in the Italian Open. His fitness regime, mostly walking on the golf course, has helped keep the weight off, which he achieved with lap band stomach surgery. He has even signed an endorsement deal with a sports drink company, helping him to start earning some money through sponsorship rather than selling trinkets at tournaments. If there is one golfer who can match Tiger Woods for pulling power, then it is John Daly. Certainly, his fans are hoping the former US PGA Championship and British Open winner can rise to the occasion one more time. Last year, Tiger Woods was reduced to watching the Memorial Tournament on television after undergoing arthroscopic surgery on his knee. The three-time Memorial champion had gone under the knife soon after the Masters and, without any real tune-ups, went on to win the US Open last year. That victory at Torrey Pines was costly, though, with Woods forced to take the rest of the year off to fix knee ligaments. He goes into this weekâ€™s US PGA Tour event at Muirfield Village Golf Club in Dublin, Ohio still finding his way back after more than eight months off the circuit. The Memorial Tournament is hosted by Jack Nicklaus, the man whose 18 major wins is the record Woods is chasing. The world number one won the tournament three years in a row from 1999 onwards but faces a tough challenge against six other top-10 players. Leading the way is Englandâ€™s Paul Casey, who is one of the form players on the Tour these days and who has risen to number three in the world. Also taking part is defending champion Kenny Perry, ranked seventh, number eight Steve Stricker, who won last week, Vijay Singh (9th), Padraig Harrington (10th) and Australian star and world number five Geoff Ogilvy. After four days of attrition and 45 changes of the lead, it was not one of the hardened stars who came out on top but a journeyman hero ranked 449th in the world and without a top 30 finish in 15 tournaments. Frenchman Christian Cevaer fired a two-over-par 74 in the final round for a total of seven-under 281 and victory in the European Open at the London Club in Ash, England. He finished one stroke ahead of a trio of players â€“ Scotlandâ€™s Gary Orr, Alvaro Quiros, of Spain, and Englandâ€™s Steve Webster. Indiaâ€™s Jeev Milkha Singh, who was the joint overnight leader, fell to a tie for fifth with Stephen Dodd and Chris Wood after his final round of 76. Northern Irelandâ€™s teenage star Rory McIlroy finished alone on 12th after his closing round of 75 gave him a total of 285. Irelandâ€™s Shane Lowry, the recent Irish Open winner who was making his pro debut, missed the cut after rounds of 78 and 73. Another pro debutant, Australiaâ€™s Scott Arnold, also failed to make the weekend after scores of 79 and 78. On the US PGA Tour, Steve Stricker birdied the second play-off hole to win the Crowne Plaza Invitational at Colonial. Stricker scored two-under 68 in the final round to join Steve Marino and Tim Clark in the play-off. All three golfers parred the 18th but Stricker birdied the 17th while Marino dropped a shot and Marino could only par. It was Strickerâ€™s fourth birdie on that hole for the tournament. Australian Jason Day was one stroke behind the leaders on 264 after his closing 69 while a further shot back was Englandâ€™s in-form Paul Casey, who shot a 66 in the final round. American Woody Austin and Fijiâ€™s Vijay Singh were tied for sixth on 266. Meanwhile, it was a pink weekend at Colonial as people responded to the â€œPink Outâ€ theme in support of Amy Mickelson, the wife of world number two Phil Mickelson who has been diagnosed with breast cancer. Two golfers who have the potential to make it big will shed their amateur status this week when they take part in the European Open at the London Club in Kent, England. Shane Lowry, the amateur winner of the recent Irish Open, and Scott Arnold, the top-ranked amateur in the world, have both entered the European Tour event hoping to make an impact in the professional ranks. 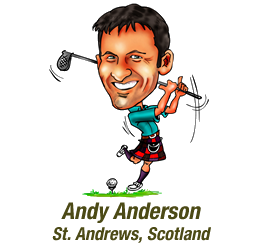 Arnold is a 23-year-old from Australia and has joined the International Sports Management agency, joining the likes of teen sensation McIlory, Enrie Els, Darren Clarke and Lee Westwood. One this for sure, it will not be easy for the two newcomers. The tournament boasts a strong field that includes US Masters champion Angel Cabrera, Sergio Garcia, Henrik Stenson, Westwood, Clarke, John Daly, Colin Montgomerie and defending champion Ross Fisher. Some battles are tougher than anything a U.S Open can throw at you. Amy Mickelson, wife of world number 2 golfer Phil Mickelson and well known philanthropist, has been diagnosed with breast cancer. Gaylord Sports Management, Mickelson’s representation on tour, announced last Wednesday in a brief press release that after “a battery of tests” Amy Mickelson would be undergoing treatment for breast cancer in the very immediate future. “More tests are scheduled, but the treatment process is expected to begin with major surgery, possibly within the next two weeks.” the press release said. The news has put on hold Mickelson’s schedule for the remainder of the PGA Tour season. He withdrew from last week’s HP Byron Nelson Championship and has put all other plans, including his return to the U.S Open at Bethpage Black in New York state, on hold. Mickelson was the runner-up there in 2002, a tournament which was widely remembered for local New Yorkers throwing their full-throated support behind Mickeson for the first time in his career. He has been gallery favourite ever since. Michael Bamberger, senior writer at Sports Illustrated recently put together a piece about Amy Mickelson, her public image, and her relationship with both her husband and the tour itself. Amy met her future husband in 1992 when they were both attending Arizona State. Amy was the vivacious, blond cheerleader and Phil (unbeknownsed to Amy) was already a PGA Tour winner, 3 time Collegiate Player of the Year and maybe the most celebrated amateur golfer in half a century. Phil would go on to amass 36 PGA Tour titles, 3 majors and more Ryder and President’s Cup appearances than anyone in the last 15 years. They have 3 children, Amanda, 9, Sophia, 7 and Even, 6. The family and an entourage of nannies can be seen traveling from tour stop to tour stop. Despite a hectic schedule of her own, Amy Mickelson still walks more rounds with her husband as she does not. Blessed with an agreeable persona, goofy smile and chatty nature on the course, Phil Mickelson has become one of the most beloved players for galleries across the world. This reputation does not extend into the locker room however, and rumors of post-tournament tantrums and cold-shouldering of fellow players circulates feverishly throughout the golfing community. These rumors often overshadow the large amount of charity work conducted by both Phil and Amy, including the science scholarships and programs they have created in conjunction with Exxon Mobile. Last year Mickelson gave a spectator $200 from his own wallet after hitting the man with a wayward drive. Regardless of the differing views on Mickelson the golfer, one could never accuse him of not being family oriented. At the 1999 U.S Open at Pinehurst Mickelson dueled the entire weekend with Payne Stewart only to be denied his first major by a divine birdie on the final hole by Stewart. What made Mickelson’s run at Pinehurst even more remarkable was the fact that he was carrying a beeper that, should it sound, would announce that wife Amy was going into labor with their first child. If Stewart had missed his birdie putt on the last hole of regulation Mickelson would have heard that beeper go off on the 10th tee the next day in the playoff. As it turned out, daughter Amanda was born the next day, father by her side. Many will recall Stewart’s reaction to that win, holding Mickelson’s face in his hands on the final green, tears streaming down his own face, Stewart told Mickelson that he was about to receive the greatest gift of all- he was about to become a father. The tragic death of Payne Stewart less than a year later only made that moment even more important, to Mickelson and to golfing history. Phil would, of course, win his first major four and a half years later at the 2004 Masters, finally shedding the tag of “best player never to win a major”. When he holed the winning putt on the 72nd hole it was a moment that appeared to contain more relief than actual excitement, and it was no surprise the first person to hug him when he walked off the final green was Amy Mickelson. Since 1992 they have been virtually inseparable. You can be sure that if and when Amy Mickelson is given a clean bill of health, the first person she will hug will be Phil and the relief felt will top anything, even winning your first major.